The COP21 Paris Agreement has legally binding obligations on stocktaking and transparency, but not on emission targets: only the “well below 2°C” limit on global temperature rise. Even with all the major COP21 pledges (INDCs), and regardless of the EU’s own ambitious targets, global greenhouse gas (GHG) emissions will increase by 2030. 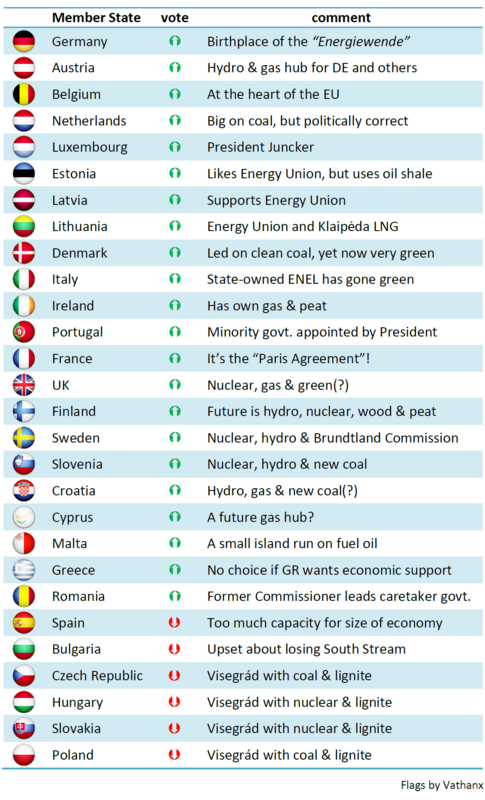 The EU’s proposed target for 2030, if reached, would see the Union’s GHG emissions fall to just 6% of the global total. And yet, global emissions still rise: the planet is not saved. The proposed EU ETS reductions would mean that emissions from the sectors covered must drop to zero by 2058. The stark reality of this proposal is that Europe would be devoid of all energy-intensive industries and perhaps have little left in the way of manufacturing industry. Jobs and emissions would be outsourced to every other region of the world. A less ambitious climate target, achieved by making efficiency improvements across the whole economy and including transport into the EU ETS, could put Europe on a better path. EURACOAL calls on President Tusk and all 28 EU leaders to reject the 40% target and to adopt a less ambitious, more realistic target that can deliver more for Europe, as described in our white paper, “Why less climate ambition would deliver more for the EU“. The letter from EURACOAL President Cieslik is available in all the working languages of the EU: Bulgarian; Croatian; Czech; Danish; Dutch; English; Estonian; Finnish; French; German; Greek; Hungarian; Italian; Latvian; Lithuanian; Polish; Portuguese; Romanian; Slovak; Slovenian; Spanish; Swedish. EURACOAL’s analysis of the possible vote in the Council shows that, for example, either Greece AND Romania, OR Spain, OR the UK must vote against, assuming that the Visegrád Group is united in its opposition to the 40% target. Note also that a Member State must ask for the old qualified majority vote (QMV) rule to be used, otherwise more Member States would have to vote against. The Executive Committee of EURACOAL elected Dr. Wolfgang Cieslik, member of the Board of Management of STEAG GmbH, as President of the European coal industry association. Dr. Cieslik, who is also Chairman of the Coal Importers’ Association (VDKi), takes on the presidency from Dr. Zygmunt Łukaszczyk, Chairman of the Board of Katowicki Holding Węglowy S.A., one of the three largest Polish coal mining companies. Mr. Vladimír Budinský, representing the Czech Association of Employers in Mining Industry (ZSDNP) and Mr. Nigel Yaxley, representing the Association of UK Coal Importers and Producers (CoalImP), were both re-elected as Vice Presidents and are joined by newly elected Mr. Janusz Olszowski of the Polish Mining Chamber of Industry and Commerce (GIPH). Please read the full press release at the following link. Click to download EURACOAL report on how a more realistic EU climate policy can deliver considerable emission reductions at a lower cost, allow economic growth and provide security of energy supply. After reading all 1,001 comments made by Guardian readers in response to “Coal lobby boss says industry ‘will be hated like slave-traders’ after COP21” (Arthur Neslen, UK Guardian, 15 December 2015), I have selected the best and republish them below. They offer a rich source of ideas and views on coal, both for and against: clever ones, insightful ones and funny ones. They will influence EURACOAL. The sweetest one sits at the very end, from OrganicPeaBrain. Vitriolic comments were thankfully few in number. I’m sure that many respectable people stand behind their shields of online anonymity, but they should remember that those shields are really only paper thin to the eyes of GCHQ. We have published the EURACOAL members’ briefing that Arthur Neslen quotes, so that his juicy bits can be seen in their proper context. While we do question the future potential of renewables, EURACOAL has no view on climate science. However, it is fair to say that many in the coal industry are climate sceptics. Skilled miners, well-educated mining engineers and professional geologists have a unique perception; they work with materials that were laid down hundreds of millions of years ago and have a better appreciation than most people of the great planetary changes that have taken place over time. Convincing them is the test of climate scientists. On climate action, I would go for economic options; as OscarAwesome states below, “The morality follows the economics.” So, we need cheap alternatives to coal. If we have to rely on public support for renewables, then there will be no “energy transition”, just lost jobs. It is easy to destroy things, very easy. Building stable societies is much harder. EURACOAL will continue to say what we think and I sincerely hope that others around the world will be free to do the same. To that end, an independent media with keen investigative journalists is hugely important in any democratic society. So, it was good to see the Guardian publish the story that needed to be published on how the UN pushed through the Paris Agreement in a way that lacked democratic legitimacy: John Vidal’s article explains this far better than I did in my members’ briefing. Like all newspapers, the Guardian has had to find a new business model in a world where we expect online content to be free. The Guardian’s “keep it in the ground” campaign is run in partnership with a US-based organisation called 350.org, founded by Bill McKibben. It’s hard to judge his editorial influence, beyond his insightful and often inciting opinion pieces, e.g. on 13 December when he wrote in the Guardian of a “pack of wolves” at Exxon’s heels and called for illegal action at the “world’s carbon bombs”. Dangerous words, but permissible in the UK’s free press. The coal industry is portrayed as a bunch of rent-seeking capitalists and, yes, I laughed at the “Australian Coal Mining Company” video on YouTube. In Europe, most coal mining is carried out by state-owned companies, companies such as Kompania Węglowa in Poland. I was there recently to celebrate St. Barbara’s Day, the patron saint of miners (Wizzair €8 flight from Charleroi, no carbon offset). I drank too much vodka with miners who work harder than I ever have to produce the coal that powers the Polish economy. They are good, decent men and women. Like me, they are wage slaves, not capitalists. Please see at this link our brochure arguing for a more realistic EU climate policy that can deliver a better environment, growth and jobs. Our COP21 report to EURACOAL members has been quoted by some media organisations. It was a mistake to share it. For those interested, the report is available here. It is not easy to explain why “less can be more”. However, in the case of EU climate and energy policy, the truth is that a less ambitious policy – some might say a more realistic policy – would deliver greenhouse gas (GHG) emission reductions at a much lower cost than a policy which favours targets that are unaffordable and therefore unrealistic. It has now become obvious that the fast expansion of solar PV in Germany from 2009 to 2013 gave the illusion of a prosperous solar industry, an illusion that has since faded. The party is over and now there is a hangover: many companies have gone bankrupt and jobs have been lost. The solar boom leaves a debt to be paid by German consumers over the next 20 years of €100 to €200 billion. Given that the prices for PV installations have fallen in recent years, it seems that less ambition would have delivered more. Technologies and the timing of their introduction are key questions. Economics is perhaps the single most important driver in today’s world. People generally want as much as possible for their money (“more for less”) and the control of GHG emissions should not be seen as being any different. This paper explores why a more progressive policy on power plant modernisation and renewal could deliver emission reductions at a lower cost to society, demonstrate global leadership and, crucially, avoid the risk of an over-dependence on imported natural gas which appears to be the default option for future power generation in many Member States without providing a reliable solution. Miners all over the world commemorate on the 4th of December their patron saint, St Barbara, requesting her continuing protection for their daily work. Mining traditions for this day span back for hundreds of years, including wearing the miners’ uniform, employee anniversaries and awards, retirement ceremonies, family trips to the mines and many other social events. Although mining is one of the most essential of human activities, one scarcely considers the raw materials needed to power and produce the products and services that we use in our every-day lives. A weekend protesting against coal might seem morally right to some, even fun. Then, they fly back to their warm homes, without a second thought for those millions of coal miners who quietly, but tirelessly provide the energy that we all take for granted. 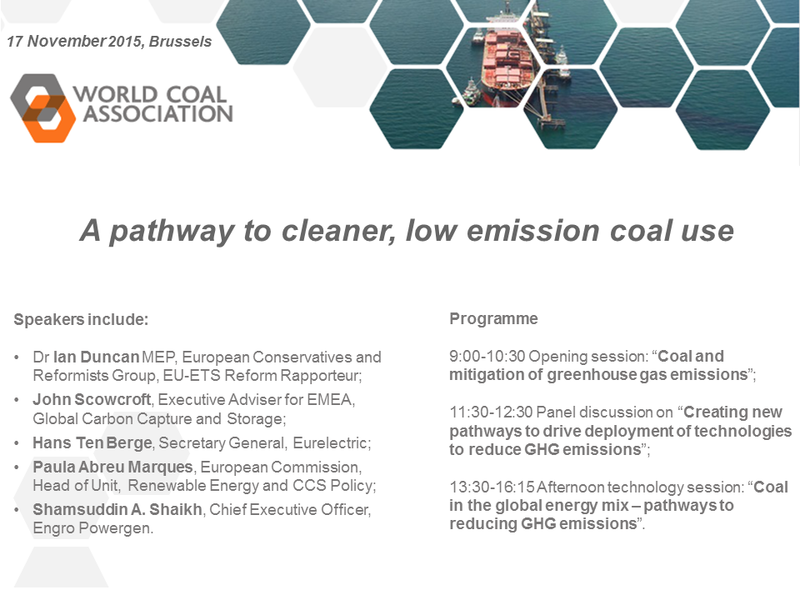 EURACOAL, the European Association for Coal and Lignite, is supporting the World Coal Association’s workshop and conference “A pathway to clear, low emission coal use”, organised in Brussels from 9:00 to 16:15 on 17 November. Vladimír Budinsky, Vice President of EURACOAL and Vice Chairman of the Board at ČEZ Distribuce, previously Board Member responsible for strategy and communications at Severoceske doly a.s., a Czech lignite mining company also in the ČEZ Group, will moderate the afternoon technology session. For the full programme please follow the link. The European Association for Coal and Lignite (EURACOAL) released a report on the funding of anti-coal campaigns by NGOs. It finds that a wave of money is flooding into the EU policy space from a small number of super-rich donors, many from the US, who hope to influence EU climate and energy policy in favour of their own preferred solutions, whatever the cost to European consumers. This is a story about money and power; a story in which Europe is viewed as a “laboratory for the world”. Please see the full press release at the following link. Full report at this link. The 11th EC-EURACOAL Coal Dialogue examined the future role of coal in Europe and current challenges with Klaus-Dieter Borchardt, Director in DG Energy for the Internal Energy Market, Marianne Wenning, Director in DG Environment for Quality of Life, Water and Air, and Céline Gauer, Director in DG Competition for Markets and Cases concerning energy and environment. Simon-Lewis, Director at the White Rose CCS project which is the preferred bidder in the UK’s £1 billion CCS commercialisation programme, argued in favour of CCS to ensure UK energy security while keeping energy-intensive industries in the country. Hans ten Berge, Secretary General of EURELECTRIC, warned that the LCP BREF review process had turned into a “coal bashing” exercise, not in response to any real risk from air pollution, but to reduce GHG emissions, whatever the cost. 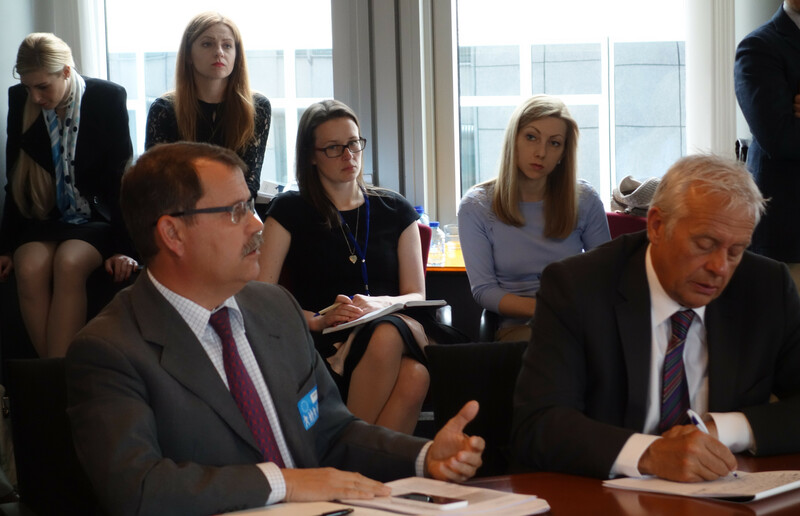 He called for the Commission to take a holistic approach when proposing amendments to the IED BAT conclusions, reflecting a true cost-benefit analysis. In his conclusions, the Secretary-General of EURACOAL said that the choice is now clear: either we are realistic and accept that it is sensible to invest in coal during the energy transition, or we fail and run old assets for longer, consuming more fuel and emitting more CO2. The Head of Unit dealing with Retail Markets: Coal and Oil at DG Energy, Jan Panek, concluded by acknowledging the role of coal as the quiet, reliable fuel that will likely be in any future energy mix due to its advantages of affordability, security of supply and reliability. To read the full report please follow the link. 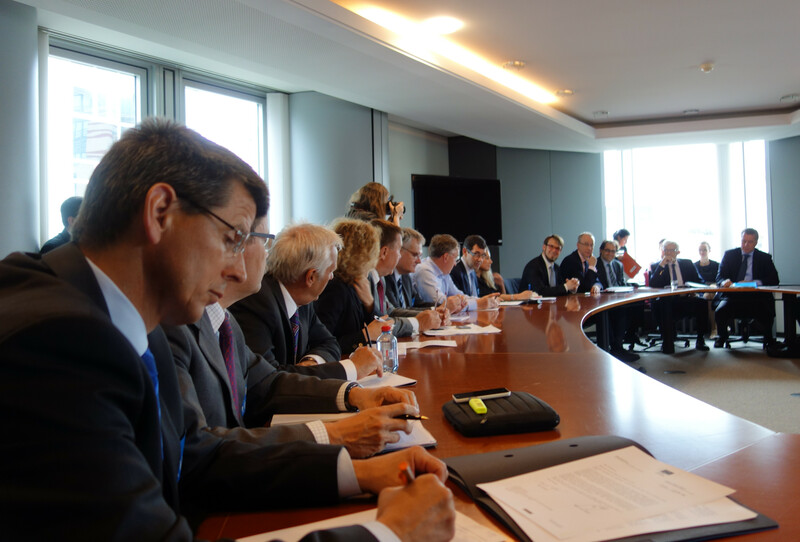 Dr. Christian EHLER MEP and Prof. Jerzy BUZEK MEP hosted the first European Round Table on Coal of the new Parliament. MEPs from across the Union came along to better understand coal and the contribution it makes to a secure and reliable energy supply: 28% of the EU’s electricity is produced from coal. Prof. BUZEK expressed his pleasure to be once again working with the coal industry. He reflected that when he entered the European Parliament in 2004, his first assignment in Brussels outside of the Parliament was a European Commission meeting with EURACOAL. Prof. Klaus-Dieter BORCHARDT gave the keynote address, touching on many of the major issues facing the energy sector, as viewed from his position in the European Commission where he is Director – Internal Energy Market. The idiom that “coal is a fuel of the past” is false, he said, “coal is back” with a leading share in power generation, a share that is growing. Dr. EHLER concluded the meeting with some positive points. He welcomed Prof. BORCHARDT’s willingness to work on a “Master Plan for Coal” with the active input of industry. Please follow the link for the full press release. Mr. Marek GRÓBARCZYK MEP, rapporteur for the Energy Union dossier and Mr. Brendan DEVLIN, Advisor in DG Energy, joined Prof. Jerzy BUZEK MEP and Dr. Christian EHLER MEP, co-chairs of the 25th Coal Round. Prof. BUZEK remarked that “low emissions”, not “decarbonisation”, was the objective for the energy sector. Dr EHLER expressed his concern that the European Commission failed to address coal use in its Energy Union communication. Rapporteur GRÓBARCZYK believed that Energy Union should be supported by three pillars: conventional and unconventional sources, nuclear and renewables in a mix that keeps prices under control. He concluded by offering his support to coal and for keeping coal in the European energy mix. The widespread modernisation of Europe’s coal-fired power plants offers a low-cost route to greenhouse gas emission reductions through improved efficiency. Other co-benefits include cleaner plants with lower emissions of conventional pollutants. Perhaps one of the most important benefits that comes from the modernisation of coal-fired power plants is the avoidance of a further “dash for gas” that would be neither affordable nor strategically desirable. Energy supply is closely entwined with current global tensions and the EU needs to think carefully about how it invests for the future. Please see at the following link the amendments suggested to the European Parliament by EURACOAL for the European Energy Security Strategy. The European Association for Coal and Lignite (EURACOAL) today elected Dr. Zygmunt Łukaszczyk as its new President. He succeeds Mr. Paweł Smoleń who is now a partner responsible for energy and resources at Deloitte Business Consulting S.A. Dr. Łukaszczyk, a Polish national and Chairman of the Board at Katowicki Holding Węglowy S.A. (KHW), brings his extensive experience of the coal industry and policy issues to the Association which is the “voice of coal” in Europe. Prof. Franz-Josef Wodopia, representing the German hard coal sector, and Mr. Nigel Yaxley, representing UK coal importers, were both re-elected as Vice Presidents and are joined by newly elected Mr. Vladimír Budinský, representing the Czech Association of Employers in Mining Industry (ZSDNP). Please click on the following link to see the full press release.